Holy Basil, one of the most sacred herbs in Ayurvedic Medicine, has been shown to possess powerful adaptogenic properties and can be used to enhance the body's ability to respond to stress, minimizing the negative effects of stress related high cortisol levels. Research shows that stress changes levels of cortisol (an adrenal hormone), and how this negatively impacts everything from weight management, to healing, and memory. In addition, studies have demonstrated that Holy Basil can support carbohydrate metabolism and, as a result, healthy blood glucose levels to help with weight management. Adaptogenic herbs such as Holy Basil are becoming more important in today's world because they improve our response to stress. Although stress itself is not new, modern forms of stress tend to be more constant and more insidious than in the past. Adaptogens can help balance our hormonal response to stress. They also aid in mitigating some of the detrimental effects of continued stress such as fatigue due to adrenal excess and reduced immunity. Many adaptogens, including Holy Basil, can also improve use of oxygen by the brain. Antioxidants are believed to be key ingredients for health and longevity, and Holy Basil contains a variety of components with free radical neutralizing and antioxidant activity. 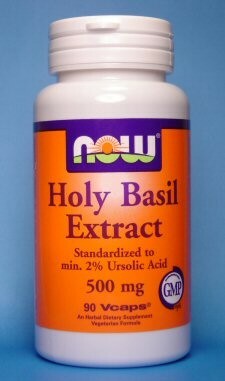 Many of the potential benefits attributable to Holy Basil are believed to be due to its ursolic acid content. Many studies have been performed showing ursolic acid's protective qualities on nerve, liver, and skin tissues as well as immune modulatory effects. Lastly, Holy Basil derivatives have been shown to inhibit the inflammatory COX-2 and LOX enzyme systems that can contribute to arthritis inflammation. Ayurvedic medicine traditionally sees Holy Basil as an herb with bitter, pungent, and astringent tastes used as a major respiratory support herb that helps to mobilize mucus with colds, flu, and other respiratory ailments. It is also traditionally used to bring down fever, for earaches, digestive disorders such as bloating or colic, ringworm, malaria, and even as a mosquito repellant. Suggested Use: As an herbal dietary supplement, take 1 Vcap® 1-2 times daily, preferably with meals. Bottle will last about 6 weeks. Other Ingredients: Cellulose (capsule), Rice Flour, Magnesium Carbonate, Maltodextrin, Silica and Magnesium Stearate (vegetable source). Vegetarian Formula.